The campaign aimed to increase brand awareness for the Tomcat pest control brand, through enhanced online reach, video views and enegament with a quirky seasonal Facebook campaign. 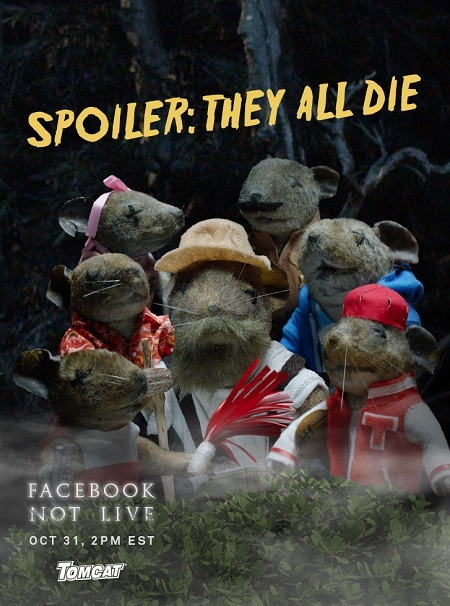 Agency Barton F. Graf created a fake trailer, along with fake posters, for the special Halloween livestream, in which Facebook users will be able to vote on what kind of gruesome deaths will befall a bunch of rodents (actually, already-dead rodent puppets), who are just trying to enjoy life as clueless teenagers on a summer cabin getaway. The new effort sees the return of the stars of the brand's "Dead Mouse Theater" campaign, which showed consumers how much fun they could have with all the deceased rodents they find in their homes, thanks to Tomcat. Spoiler: They All Die," reads one of the print ads. In the video, there's the obligatory nod to The Shining, with a warning scrawled in red on a mirror. That's not to mention the name itself. "Facebook Not Live," reads the trailer's tagline. "On account of all the dead mice." The event itself reached 2.3 million unique users. Plus, 21% of the movie viewers actively participated in murdering the mice and most impressively, it increased the Facebook fanbase by 58%. The ad also won a Cyber Lion at the Cannes Lions awards in 2017.